Firstly, let’s look at the traitor, Edmund. If the stories were to align, Edmund, who represents Judas, would be killed in a gruesome manner and be hated for thousands of years and counting. Woe would be upon him, and he would have been better unborn. So what happens to Edmund then? Well, he’s forgiven by Aslan and, along with his siblings, becomes a beloved monarch of Narnia. If the stories of Christ and of Narnia (at least the Lion, The Witch, and The Wardrobe) were to align, then Edmund’s fate would indeed be different – more gruesome, and a lot less pleasant. But perhaps Edmund is a poor example on how the two stories align. After all – while Edmund represents Judas, a strong argument could also be made to say that Edmund also represents Humanity in general. After all, it was Aslan sacrificing himself for Edmund, just as Christ sacrificed himself for the sake of humanity. If the Judas / Edmund connection were the only case of the two stories not aligning, I seriously doubt I would pursue this subject at all. However, there is another section in particular is a more of a misalignment. Aslan has been taken by Jadis to be sacrificed instead of Edmund. Those followers loyal to Aslan prepared to fight the forces of Jadis. If the two stories lined up perfectly, the followers of Aslan would hide in fear of their lives, just as the Disciples of Christ hid after the crucifixion. Those disciples who did not fear repercussions (or perhaps just didn’t care), went back to their old lives – back to their fishing boats. Regardless of the reaction of the disciples, it was not the reaction of the people of Narnia. The disciples of Christ had lost hope. They knew nothing could bring Jesus back. Those loyal to Aslan didn’t seem to care that there was no hope left even though Aslan was dead and they also would die if they fought. Perhaps they could have fled to another land, perhaps they could have made a deal with Jadis – maybe spend a year as a stone statue in punishment – and then back to their normal lives again. Mind you, I digress a little, but the point is that the people of Narnia, much like the disciples of Christ, did not have any hope – yet unlike the disciples of Christ, the people of Narnia did not let the lack of hope change their decision to fight Jadis and her forces. If The Lion, The Witch, and the Wardrobe were a perfect allegory, the people of Narnia would not have fought this battle. So – the stories of The lion, The Witch, and the Wardrobe and that of the Life, death, and resurrection of Christ do not line up. What’s the big deal? I entitled this article “Saving Narnia” for a reason. The fact that the two stories do not intertwine perfectly means that there’s room for other interpretations of the stories of Narnia, other than that of allegory. Sure, there’s nothing wrong with seeing “The Lion, the Witch, and the Wardrobe” and the other stories as an allegory for the life, death, and resurrection of Christ – but it’s far from the only interpretation that can be found in this story. If there is textual evidence for an interpretation can be found, then that interpretation is true regardless of what the author says. Granted, the fact that there might be several interpretations to a story is English Lit 101. 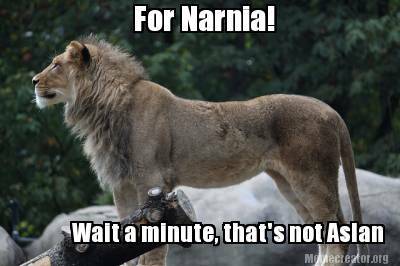 Still, there are those that believe if you do not interpret the Narnia stories in their own, narrow, viewpoint, then you are wrong. This is hardly the case, and far be it from me to commit the intellectual fallacy, but I believe that CS Lewis would fully agree that one could find alternative meanings to any story. If you have an alternative interpretation to the Narnia books, don’t be afraid to share and discuss them. This shouldn’t be something that needs to be said, but even in our increasingly secular culture, the Jesus interpretation of the Narnia books seems to be the only one that is accepted. Even Robot Chicken describes Aslan as “The Jesus allegory lion.” But one should never push their interpretation of literature (or music, or movies, or video games, or…) on any other person. One should present their case, yes, but one should also be open to other interpretations, as interpretations will differ in a subjective mediums. If you find an “unorthodox” interpretation of the Narnia books – or any books for that matter – fight for it like the followers of Aslan fought the forces of Jadis. Your personal interpretation is your own personal Narnia – and Narnia needs to be saved.